To schedule an appointment, please call our office at (610) 566-3326 during office hours. If you haven’t visited our office before, please read our brief article, What to Expect, for information. We look forward to seeing you! If you need to cancel or reschedule an appointment, you must call our office at (610) 566-3326 during office hours. Cancelations cannot be made via e-mail or voice mail. Thank you for your cooperation. Our office is easily reached by car or public transportation, and our facilities are handicapped accessible. Take I-476 (Blue Route) to exit 3 for “Media/Swarthmore.” Exit on to Baltimore Pike in the direction of Media. Turn left at the second traffic light, on to Beatty Road. The office is at the end of Beatty Road, on the opposite side of Providence Road. If you are using a GPS or satellite navigation system, please use the following address for accurate directions: 519 Jefferson Street, Media PA 19063. SEPTA’s trolley Route 101 provides the convenient access to our office. Take the trolley to the Bowling Green (Providence Road) stop and then walk .2 miles south on Providence Road, crossing over Baltimore Pike. The office will be on the right side of the street across from Beatty Road. Trolley schedules are available from SEPTA. We work with almost all dental insurers, including United Concordia (for employees of Comcast, Chevron, and NBC Universal). 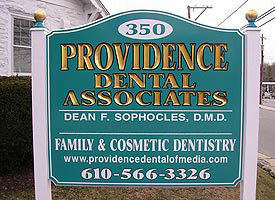 Please bring your dental coverage card and literature with you to our office at the time of your appointment. We are happy to complete and submit your claim forms electronically, for faster reimbursement. We will answer your insurance questions to the best of our abilities. The purpose of dental insurance is to cover some — but not all — costs. Please keep in mind that you are responsible for your total obligation, should your insurance benefits result in less coverage than anticipated. We ask that payment be made during each office visit, unless other arrangements have been made with our staff. Full details are available in our Financial Policy (PDF). Thank you for your cooperation in this regard. It allows us to keep the costs of providing excellent dentistry down, as well as minimize the need for significant future fee increases. We accept payment by cash, check, or major credit card (Visa, MasterCard, Discover, and American Express). Payment plans through Care Credit are another option for more expensive treatments. Being a member of out Providence Dental Savings Plan offers you the ability to obtain your dental treatment at reduced prices. In an effort to help our patients, we have designed an affordable alternative plan to maintain your dental health. This is not Dental Insurance, and is exclusive to our office. Our Providence Dental Savings plan will allow you the opportunity to visit our office regularly for your preventive dental care. In addition, all other dental treatment, if necessary, will be discounted up to 10%. Our Plan is available for purchase by individuals and families. Breakdown of discount is as follows: Preventive Care includes two cleaning and two exams at no charge; plus 15% off of all X-rays, 10% off of all Basic Dental procedures, 10% off of all Major Procedures, and 10% off Invisible Braces (Invisalign/Clear Correct). This Plan can only be used at Providence Dental Associates. There are no discounts for any outside referrals or third parties. Full payment of fees is due at the time of service or if otherwise stipulated in financial contracts. Enrollment fees and posted fees are subject to change at the renewal of each enrollment period into this Plan. There will be a fee for a broken appointment without 24 hour notice. A second missed/broken appointment nullifies participation in the Plan and the enrollment fee is forfeited. Not transferable to another party. Does not include work in progress. Cannot be combined with any other insurance, dental plan, coupon or discount, Failure to comply with this provision will result in termination from the Plan and forfeiture of the enrollment fee. Excellent dentistry doesn’t count for much if it’s beyond your means. We are committed to making your dental needs a reality! Please call our office at (610) 566-3326 during office hours if you have any questions regarding your payment options or if you wish to enroll in our Providence Dental Savings Plan.